The ancient and exotic Neera! The ‘Purananuru’ is an ancient Tamil text written in the sixth century AD that talks about Neera long before the West started talking about handcrafted beverages. Along with the kings and their greatness, generosity, ethics and philosophy, the poems in this ancient text describes Neera as a royal drink. Sadly, it is now looked down upon as a poor man’s thirst quencher. 1. It is nature’s own stomach soother, improves gut health, eases bowel movement and rids you of bloating. This is because it contains the pre-biotic, inulin, which is at work here. Yes, the pre-biotic that you will find in fancy bottles online, but nothing comes close to this natural healer. 2. Has inositol, which has fat burning, anti-anxiety and irritability-reducing properties. This means lesser extra inches and better stress handling abilities. 3. With a low glycemic index (GI) and loads of Vitamin B, it’s not just safe but great for people with insulin-resistance and diabetes. 4. Naturally high in electrolytes, it makes for a great summer drink, especially when you feel that you are coming down with a throbbing headache or simply trying to recover from the hangover of last night’s party. 5. Is India’s native detox drink. Helps in recovery and rejuvenation of the liver and has always been used as medicine for jaundice, much before the Indian Institute of Science, Bengaluru did a study that documented and established its magical properties. 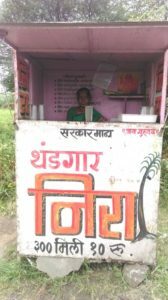 Once sold near all major railway stations, Neera can now be found in these small green kiosks alongside highways and expressways outside the Mumbai city. So the next time you are going out of the city, you know what to stop by for? A glass of Neera!! Are Sabja Seeds part of your Summer Diet?